The influenza virus is responsible for thousands of death each year, including many children. Symptoms often include a quick onset of illness, a high fever (103 degrees or higher), body aches and chills, headache, severe exhaustion, and decreased appetite. Your child may also have a cough, sore throat, and in some cases, vomiting and/or diarrhea and belly pain. Influenza is often mistaken for gastroenteritis (the stomach flu) which can lead to vomiting, diarrhea, stomach cramps, and fever. The best way to prevent both types of flu is by encouraging your child to wash their hands, and to avoid close contact with someone who has the stomach bug. Pink eye is an infection of the clear membrane that covers the white part of the eye and the inner surface of the eyelid. This common eye disease can be caused by a bacterial or viral infection as well as allergies, pollutants such as smoke, chemicals in cosmetics, or chlorine in pools. A child may complain of eye irritation, excessive tearing or discharge, swollen eyelids, and redness in the whites of the eyes. A child can get pink eye simply by touching something that an infected child has touched, and then touching his own eye. Pro Tip: Remind kids not touch their eyes, nose, or mouth, and wash their hands frequently while at school. This common infection in kids is caused by a strain of bacteria called group A streptococcus. Strep throat is highly contagious and can spread through airborne droplets when someone who has the infection sneezes or coughs. Strep throat can also be transmitted through sharing drinks or food, or by touching a surface such as a doorknob that is harboring the bacteria and then touching one’s own eyes, nose, or mouth. Your child may complain of a sore throat and pain when swallowing, and she may have a fever, rash, headache, nausea or vomiting, tiny red spots on the back of the roof of the mouth, and swollen tonsils. Teach your child to be especially careful about sharing things with friends and classmates who are coughing or sneezing. Remind your child to wash her hand often, especially if a classmate is sick. Colds are usually caused by rhinoviruses, which are microscopic organisms that can live on surfaces for hours. They enter the lining of the nose and throat and multiply, triggering an immune system response that causes sore throats, cough, headaches, and sneezing. 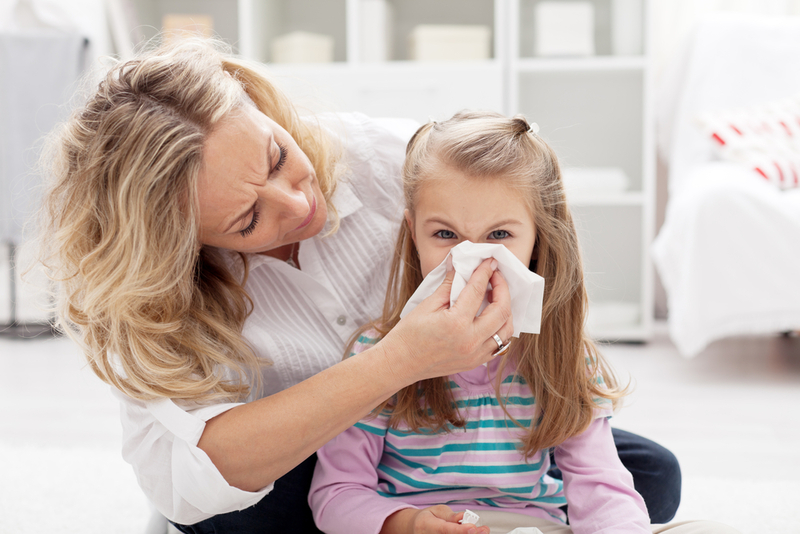 Your child may also develop a stuffy or runny nose and mild fever. One of the most common ways they’re transmitted is when a child comes into contact with a cold virus and then touches her eyes or nose. Make sure your child frequently washes their hands, and remind them to avoid touching their mouth, nose and eyes. Lice are tiny parasitic insects called that spread by personal contact, as well as by sharing belongings. Children are particularly likely to catch and spread lice. Itching is the most common symptom of lice, since their bites cause an allergic reaction. Tell your child to avoid head-to-head contact with other children, and never share clothing or hats. Even with good hygiene practices, your child may still develop lice. A simple OTC remedy and 2 week follow up should eliminate the lice. While the fall and winter months are notorious for cold and flu season, there are measures you can take to protect your children from those and other common bugs. Contact Us to learn more or to schedule an appointment with our pediatrician.